It’s all fun and games until something gets broken, and then it’s time for art. It was a very sad day for me when this family heirloom mixing bowl got broken by accident over the holiday. This was one of my favorite bowls of all time because it was so versatile, and it was thought to be between 60-70 years old. 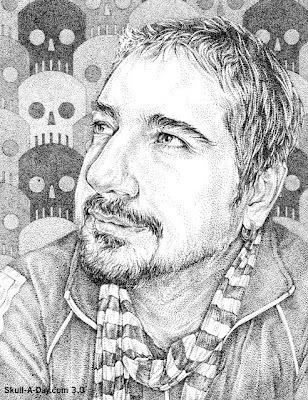 My loss however is lessened knowing that it will continue to live on in this new artistic role. One of my favorite things to do these days is to check our submission box. It brings me such joy to find the great talent artists that are out there. Thank You for submitting your work. What an amazing piece you have shared with us. I am most in awe of the seamless treatment between the overlapping colors, you truly have captured the feeling of a painting in this medium. If your organization is looking for a speaker on generating creative energy I'd be happy to talk about traveling to your town as well. 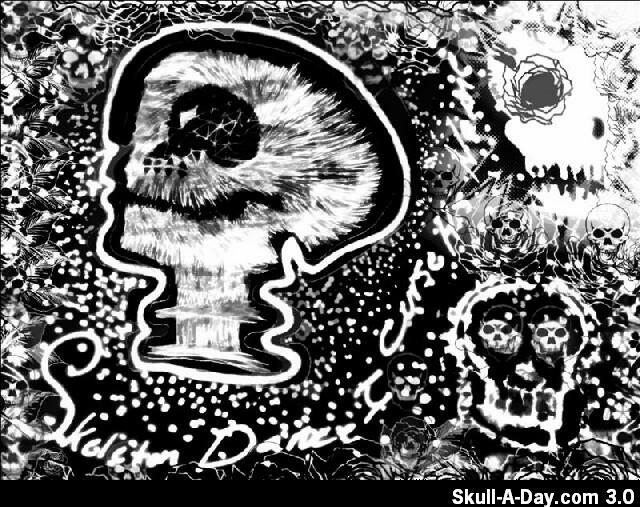 Contact me at "skull" at "skulladay.com". 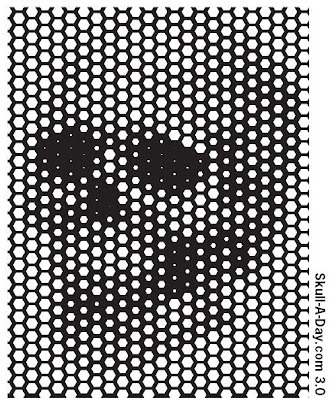 As a Skull-A-Day editor some people would say that I have skulls on the brain, or a head full of skulls. 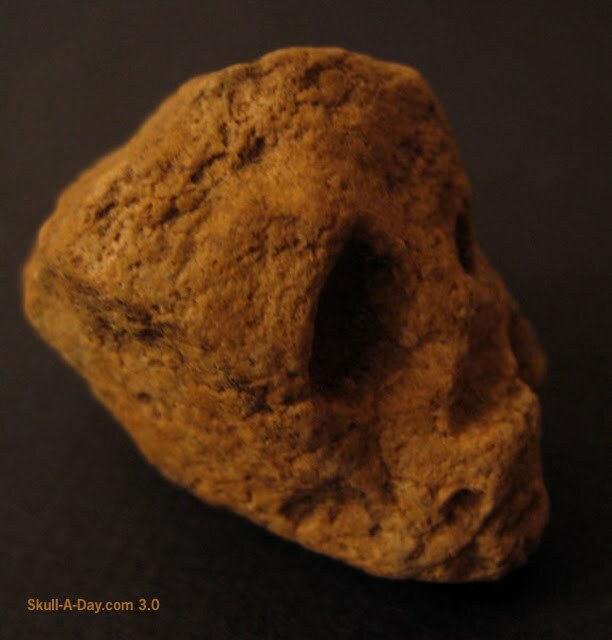 Well, I've also been accused of being a hard head or a rock head so I knew that I was destined to present to you today's stone skull simulacrum. 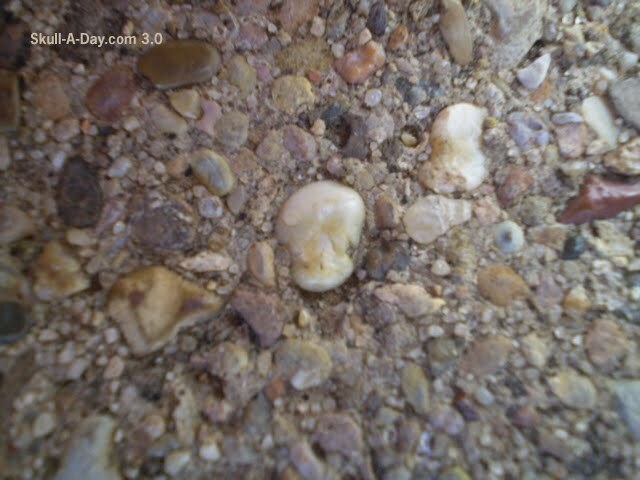 First up is this tiny(1/4") stone that my very own wife found in the cement sidewalk in front of my Mother's house. Next up is this rock from Richard who writes, "Thought you'd get a kick out of this. Found this out near Falls Lake in Raleigh, North Carolina. Doesn't work as well looking at it from a straight on perspective. 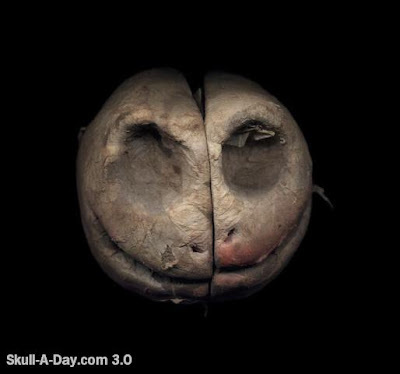 But (I think, anyway) that it looks very skull from a profile perspective." 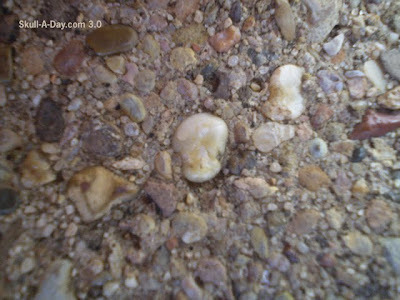 And finally, Todd fom over at Neatocoolville found this fantastic rock that can be mistaken for nothing other than a skull. He even recommended Richard from above to submit his rock, so kudos to you for spreading the word, Todd. Thanks, skullhunters. 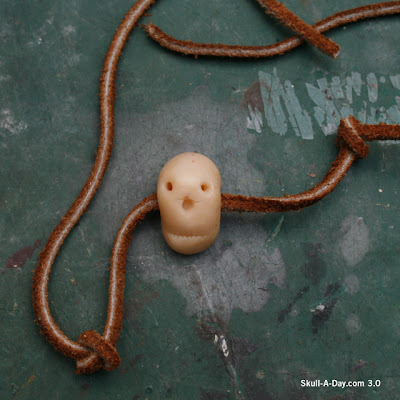 May all of your stones be turned to treasure, or at least into a skull shape. Keep up the great work and keep sending those pictures in to our submissions address. Just keep in mind that since we only post simulacra once a week it might take a little longer than normal for it to be posted. Angie Lisle submits this wonderful drawing titled "Using Your Head". 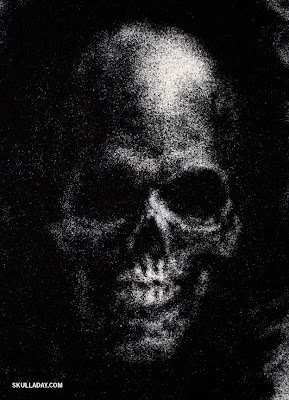 She tells us, "The drawing is featured in ArtWanted's 2009 Halloween gallery, Haunted House". Great work, Angie. The Haunted House exhibit was the perfect place for it to be displayed. Thanks for submitting it. 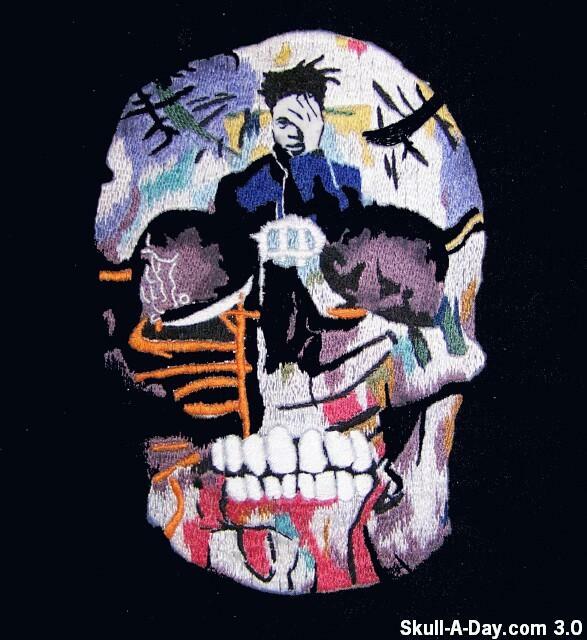 Street Anatomy made a kind mention of the new sweater from Sibling featuring my psychedelic skull art. 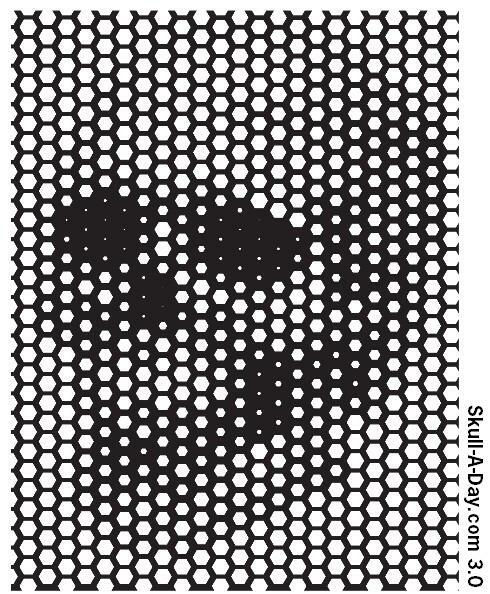 Next up is Tyler M. Whaley who made this skull image using hexagons. 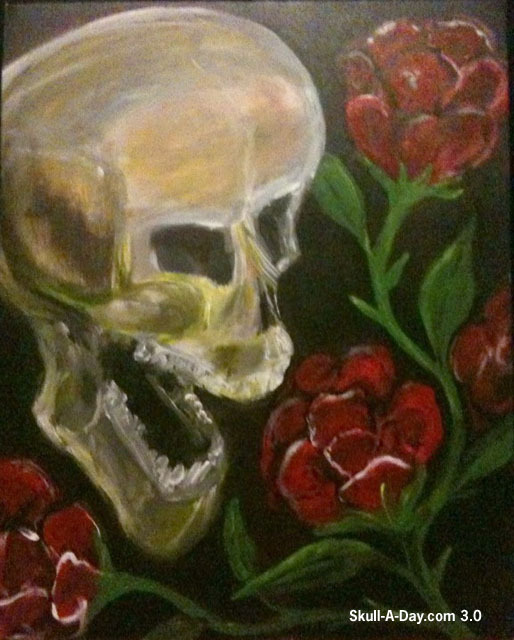 and last up is a old friend of Skull-A-Day Joseph, AKA Jozip, from Sedona, Arizona met the Skullmaster's logo challenge with this piece. Thank you all for submitting your work for us to feature. I think what I like most about all these pieces is the use of a single color pallet, its simple, classic, but powerful. Keep up the great work. After the big meal it’s time to join us for dessert. Today we offer a few slices of Pumpkin Skulls as we celebrate this Thanksgiving holiday. 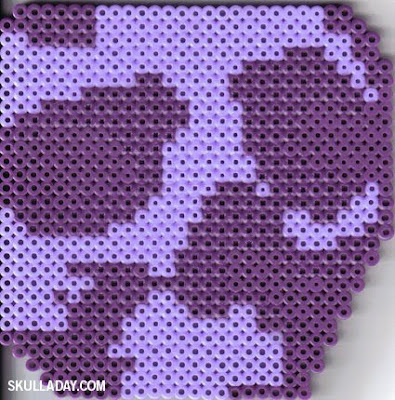 Enjoy this special bonus treat from Skull-A-Day. Although the calendar says we still have a few more weeks of Fall, Thanksgiving in my option always is the death of the season. From here on out it’s snowflakes and snowmen around my neighborhood until spring. Thank you all for taking the time to submit your wonderful creations. If you get an inkling to decorate something before next year, I hear turnips are the way to go, but they don't make very good pies. JP from way down in Houston, Tx writes to us, "I went to some fun little place called Pinot & Picasso out in Houston. Concept being, bring your own food and drink and they provide canvases and paint and teach everyone to paint while they get drunk. The painting they picked to teach everyone to paint was called "Seaside Village". I kind of went off the grid with my own thing and the attached photo is what came out. I still titled it "Seaside Village" for laughs. 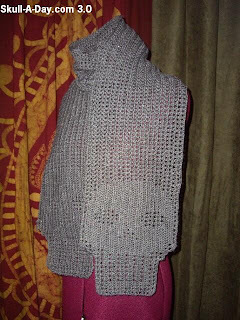 Posted it up on my Facebook page and a buddy pointed me to your project. Figured what the Hell? Why not submit it? Cheers." I love the fact that you kept the title even after doing your own thing. Lesson learned, don't let others always confine you to one idea, no matter what they call it. Thanks, JP! 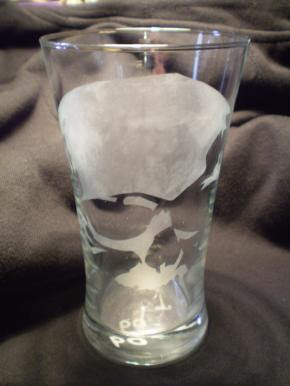 I'm happy to announce that Tatman, who has been co-editing the site this year, is now selling some beautiful hand-made official Skull-A-Day etched drinking glasses featuring my Skull Stencil as well as his own original art! 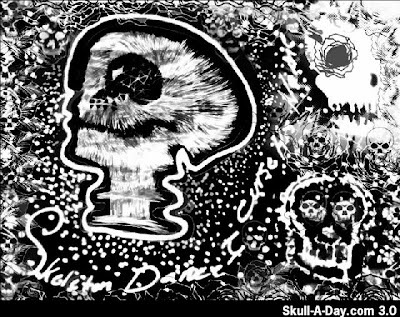 Please consider buying some to show your support for Skull-A-Day and thank Tatman for the hard work he's put into the site! 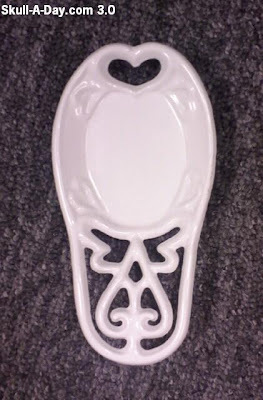 Visit Tatman's Glass for more details and images. p.s. He even offers custom work, so don't hesitate to contact him if there's something else you'd like etched on a glass. 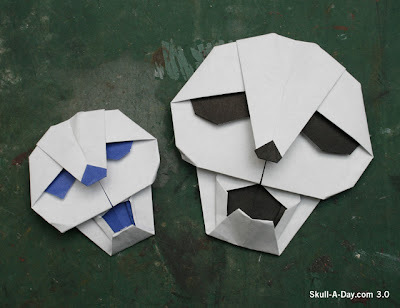 [BONUS] The Gift of Skulls - Whimzkulls! 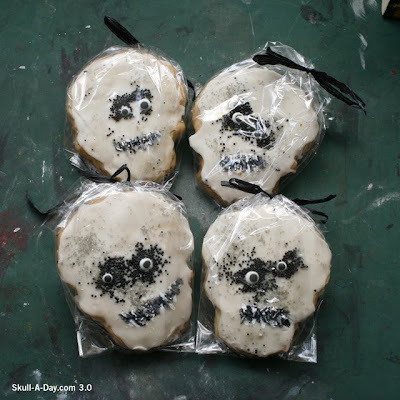 A big thanks to Briannaa in LA, who sent me a box of her fantastic Whimzkulls cookies! Not only do they each of these thick frosted cookies (which are about 4 x 4.5") have a uniquely funny face, but they are absolutely delicious (like buttery shortbread)! Brianna has just started selling them online so definitely check out Etsy page if you're in need of a one-of-a-kind treat! I hear there may be some holiday themed ones on the way and she'll even do requests. Congratulations to Beyond The Wall of Sleep and Magπ who were the two randomly selected winners of the Subjekt Ruffian Skull Earphones giveaway! Thanks again for everyone who participated, I loved reading all of your submissions! Stay tuned for more giveaways and contests in the near future. And don't forget you can get a 20% discount if you want to buy a pair of your own Ruffian Skull Earphones from Subjekt by using the code "skulladay" when you order. Let's get to the point with today's TWT. 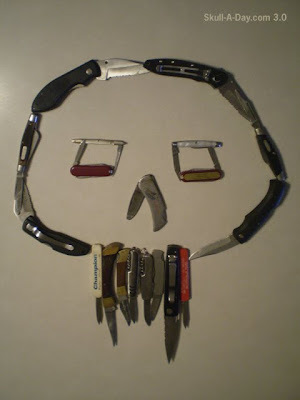 I have always liked knives and I have a collection of assorted pocket knives so what better way to put 2 of my likes together. 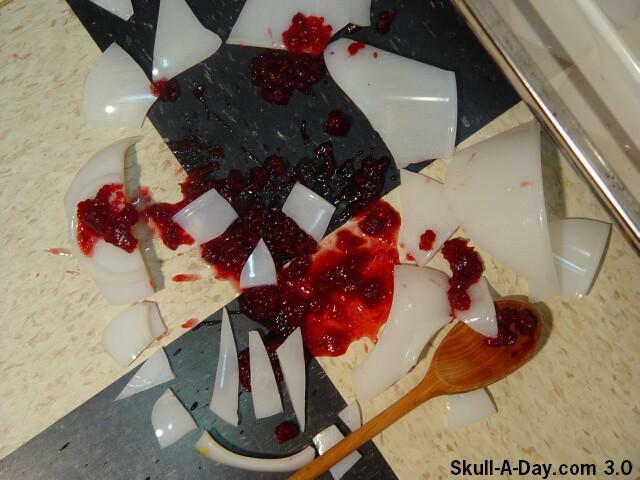 It might not be the sharpest skull in the shed, but it will cut you if you aren't careful. 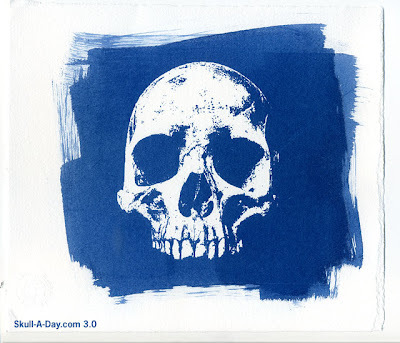 Technology Designer, Matt Shapoff, created this nice skull print he calls "Numb Skull". He also has them for sale in a tastefully done mahogany frame located here. Thanks for sharing, Matt! “Horn of Amalthea” approx. 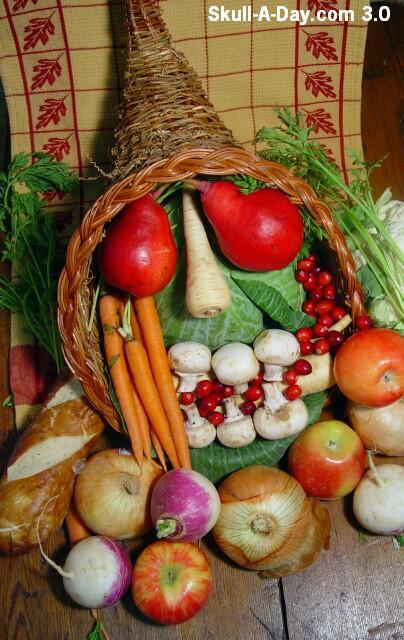 12" X 11" wicker cornucopia arranged with apples, cabbage, cauliflower, carrots, cranberries, mushrooms, onions, parsnips, pears, and turnips. Since last week’s skull was about a modern tradition, I decided to go back to do a more traditional depiction this time, and what’s more traditional than using a symbol going back to the 5th century BC? In getting ready for the Thanksgiving Holiday this week, I ventured out to the sacred grocery grounds to hunt and gather this bounty of fruits and vegetables that will be prepared later on this week for the big celebratory feast in which the different tribes gather for the day. The detail work on this is incredible, you show off some amazing talent with this piece. 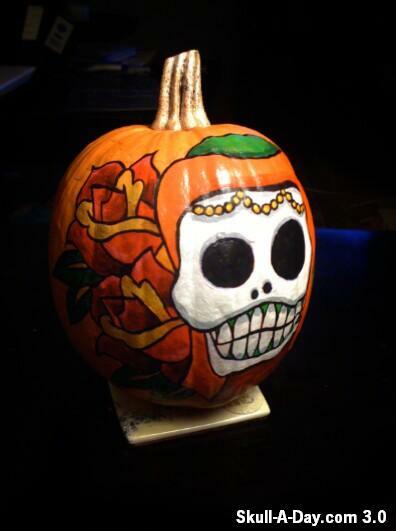 Thank you for submitting this wonderful interpretation of a sugar skull for us to share. 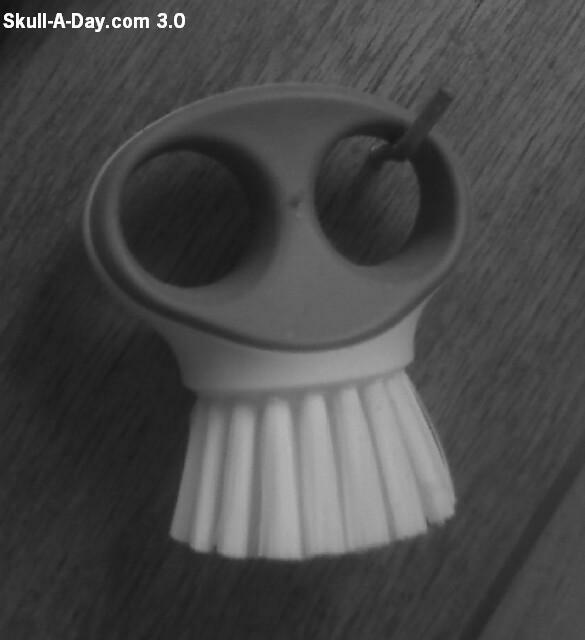 A past contributor here, Joseph AKA Jozip from Sedona, Arizona sent us this: “How about playing us a little tune, eh skully? 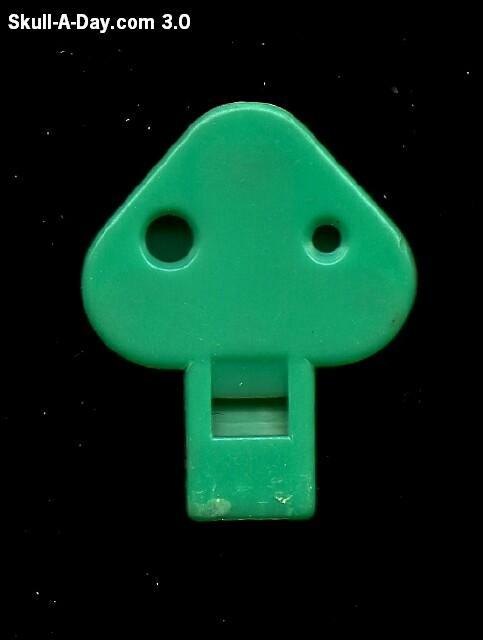 Kids ocarina whistle. No it wasn’t photographed in space, that’s not a starfield, just dust on my black photo backdrop. Also note the teethmarks from my 6 year old daughter. She just learned how to work the holes to get different notes. 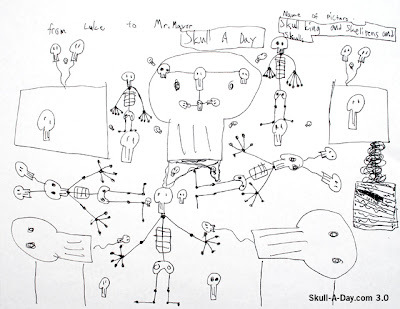 We have traced the skulls and they are coming from inside your house. 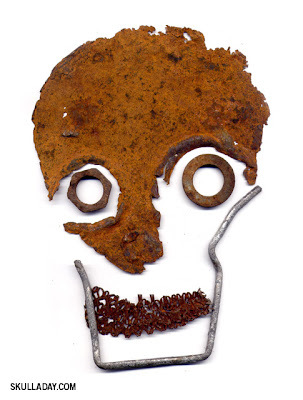 Thank you for submitting your finds to us. 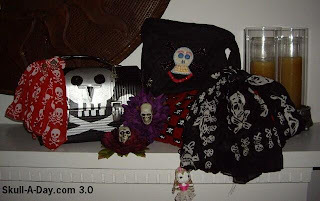 It is always a joy to see the many different skulls we use everyday. I also ran into a simulacra this week, but I can't find the memory card that it is on. Hopefully I will have it for you in two weeks. Straight out of Utica, NY comes David Cahill and his excellent oil painting on panel titled "If I could reach you I would slap you". I totally like the extra stuff included in this piece because I have owned all of them. From what I've seen here the only slap you need is a pat on the back. Thanks for the great piece and flashback. 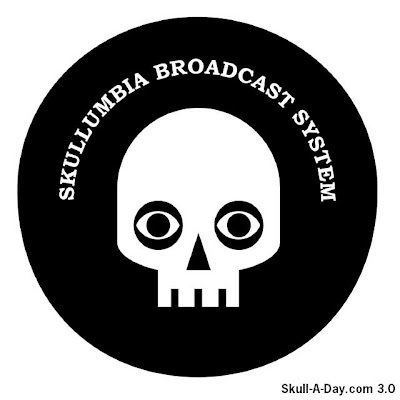 As many of you are aware Skull-A-Day has been a member of the Facebook community since February 12, 2008. If you have not yet done so you can become a fan here. 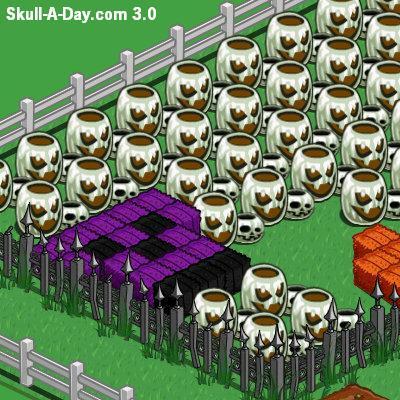 The Skullmaster has even developed a Send-A-Skull app so that you can send skulls to all your friends. While no other app can compare to his (IMHO) there are some that have worked their way into everyone’s Live Feed... they have proven the reason why you can't spell “Ville” without “Vile.” Sorry, I digress. 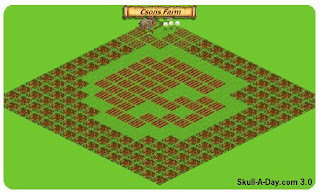 Now, without further commentary, today’s skulls show off the creativity that can be found in the current Farmville game phenomenon. 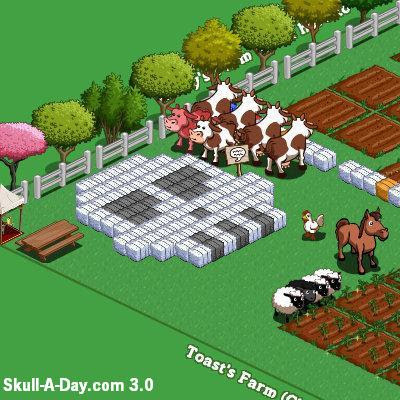 Since I landed in the social media world, I also have been playing with virtual farming. 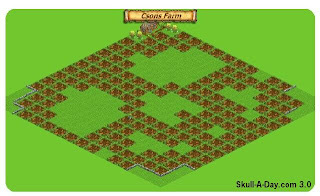 The app I use is called myfarm. 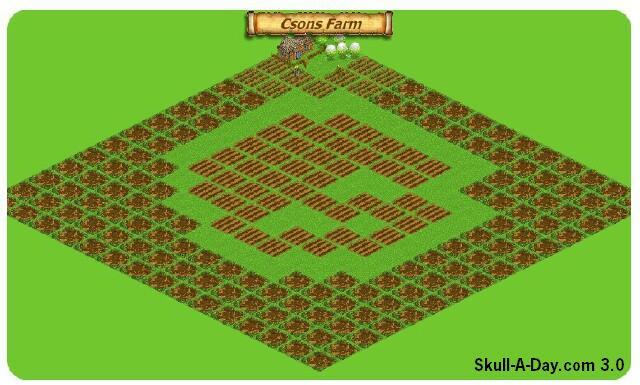 Since it was on today’s topic and Friday after all let me flashback to two of my attempts at creative virtual skull farming. You may recognize the first one from this original Skull. This one was inspired from here. Facebook apps: either you love them or you hate them. However, let me tell you there is no question that we love when our readers are inspired by the Skull-A-Day and create something unique for us to share. Thank you both for submitting your art with us, now get back to work you have ribbons to earn and cows to find. P.S. If anyone out there still plays myfarm you can friend me here and be my neighbor. Thanks also to Denny who gave me a skull bracelet he got in Olvera Street in LA and Rich who hosted me in Philly and gave me some vintage matchbook covers with skulls on them! Don't forget you til just Midnight Eastern Time TONIGHT to enter to win a set of Subjekt's Ruffian Skull Earphones! The details are HERE. Skull makers Chuck Banaszewski and Matt Krise show off their skills with this t-shirt print they title "Punk-O-Sapien". Great work, guys. I really liked all of the designs found in your store. Especially the Mind Grenade. Thanks for sharing. And now we know the true fate of the man behind the curtain. I know I would never have the patience to do any sort of a mosaic so I commend your work. Thank you for sharing this piece with us. 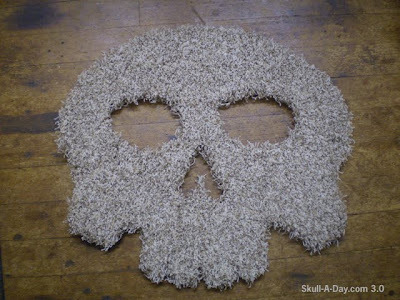 For some more amazing (non-skull) work please check out Mr. Clegg's link above. As a part of my new job I am working with all types of flooring including carpet. I couldn't think of a better way to initiate Skull-A-Day readers to this other than by showing them the new "skullcome" mat. TW Brown from Hermosa Beach, CA says, "Screwing around with the Wacom tablet. 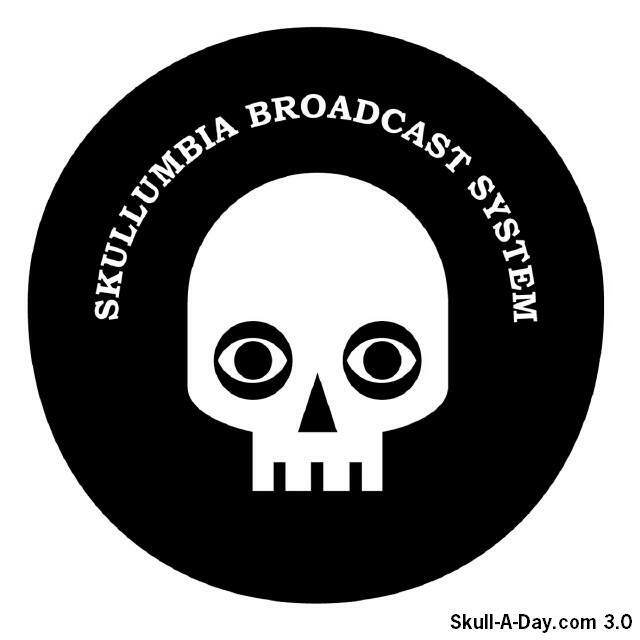 I've wanted to submit to Skull-a-Day for a while now." If that's what you call screwing around then I'd like to see what you can do when you try, TW. Nice work. 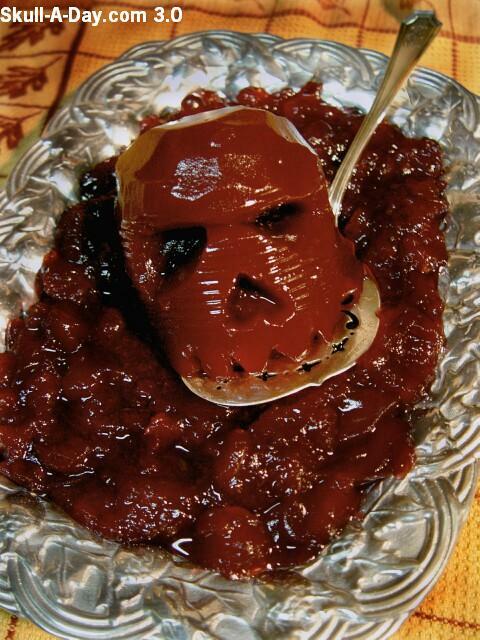 This week’s offering is Cranberries, Jellied. When I went into the store today, there was a huge display for the upcoming Thanksgiving Holiday. Seeing the giant display of cranberry jelly cans made me think of this song and the rest is C-story. While the strife in Northern Ireland is no longer making the news it did 20 years ago, there are still plenty of places in the world today that could use our attention , please keep them in mind this holiday season. 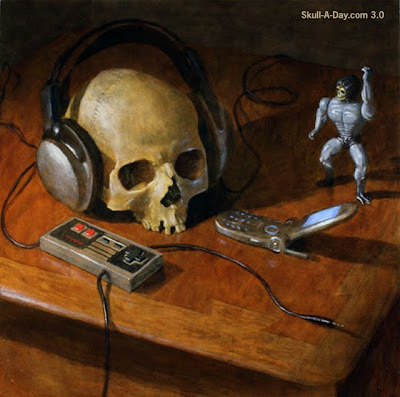 Don't forget you have until just Midnight (Eastern Time) on Thursday to submit a skeleton band name and be entered into a random drawing for one of two pairs of the awesome Subjekt's Ruffian Skull Earphones! Leave your submission on the original contest post HERE. Stéphane Chassignole from Marseille - France sent us this skull that he described as being made with clay, covered with paper, and a bit of paint. It just might be all the influence of the recent Sesame Street celebration but this reminds me of what a Muppet skull might look like. Thank you submitting such an extraordinary piece. 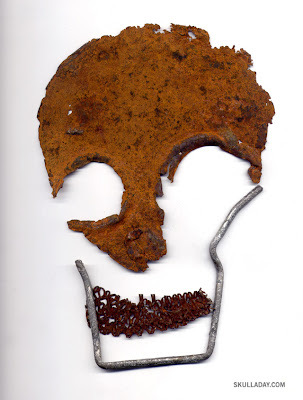 Also if you get a chance to check out Stéphane’s link at the top, there is another interesting skull in the “atelier” section. 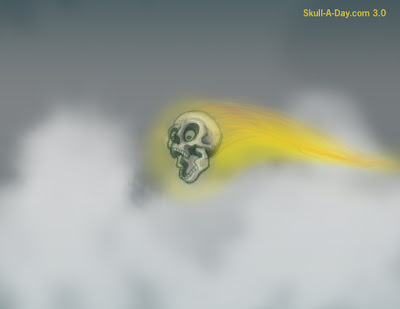 It has been a couple of months since we last did this, but it being the 15th of the month it is time to feature another fanatic who makes Skull-A-Day so special for all of us. 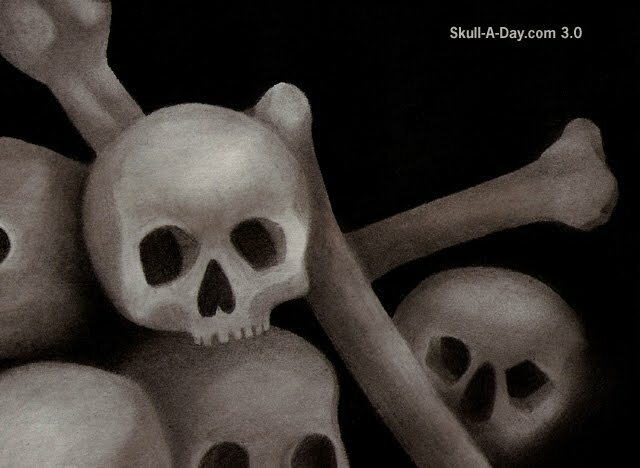 Sit back, grab your favorite soothsayer and enjoy a part of Skull-A-Day that even Caesar himself would not be fearful of. This month’s fanatic is Abby Davis from Richmond, Virginia. Thank you for being part of the Skull-A-Day tribe. It is always wonderful to see what inspires each of us daily. Ms. Davis has been a frequent commenter on the sight and has even contributed to the project here. 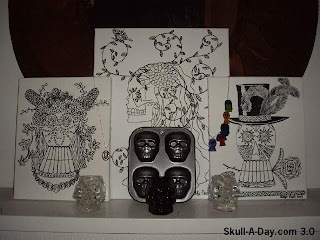 If you get a chance make sure you also check out her Etsy shop for more skull inspired designs. 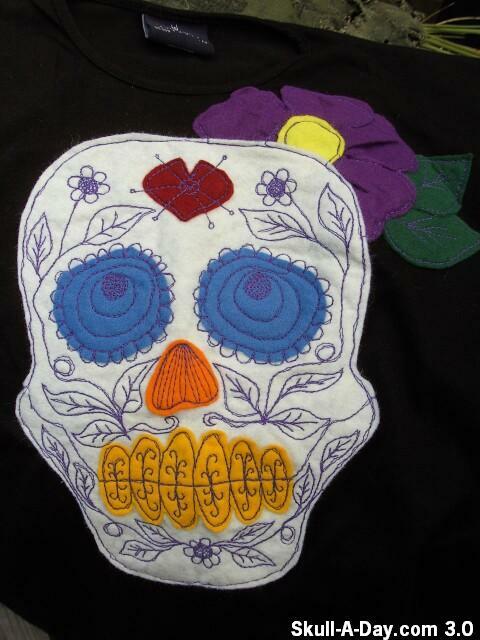 Are you a certified/certifiable Skull Fanatic? 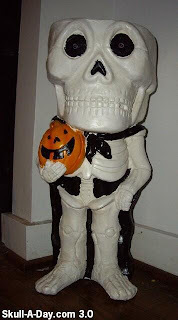 If so, send an image or two, maybe a video of your personal skull/skeleton collection and tell us a bit about what makes you so crazy for skulls, how many skulls you may own, or whatever else you think is pertinent! 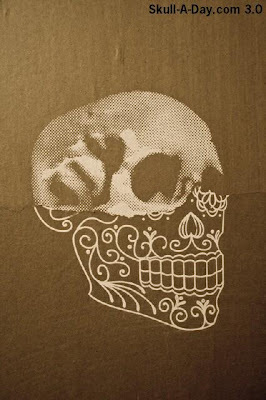 [CONTEST] Win a set of Ruffian Skull Earphones!